If you are looking for information about garage door installation in Chicago, you’ve found the right place! 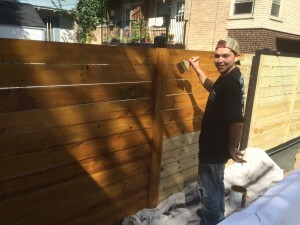 KG Doors & Gates is a family owned and operated company that serves homeowners and business owners in the Chicago, IL area. We can provide you with the best garage door installation services in Chicago that are backed by industry leading warranties. Imagine what your property could look like after we give it a major makeover with a new garage door or gate. It has the potential of boosting curb appeal, increasing property value and enhancing security (and if you’re selling, that’s a bonus feature). You’ll be happy to know we only use the highest quality of parts to ensure complete satisfaction, which is why we INCLUDE a warranty. We also can provide you with a wide variety of garage door options from multiple manufacturers in the styles and colors of your choosing. Also, you can select motorized garage doors or manually operating ones – the choice is yours. Additionally, if you need help picking the best look to complement your home or business, our technicians would be more than happy to provide you with some suggestions to help in the decision making process. Like mentioned above, we are a family operated and locally owned company, which means we hold our values to a higher standard. We treat all of our customers like family because we understand the value of hard work and quality results, so you’ll always get the best garage door installation as if we were doing it on our own property. With all of our knowledge, experience and passion, we strive to provide you with the best garage door installation in Chicago! We will stand out from our competitors because you’re more than just business to us, you are our neighbors. To make an appointment for gate or garage door installation in Chicago, please contact us by calling 888-790-7624. Don’t forget to take advantage of our FREE estimates and other garage door services in Chicago!